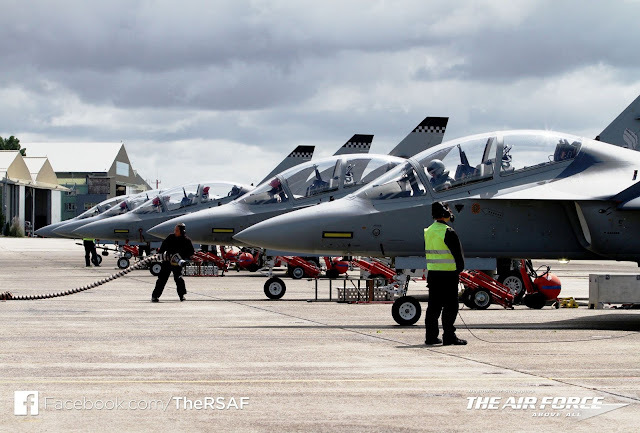 Is your country in the process of acquiring or have already acquired advanced 4++ generation multi-role combat aircraft ( MRCA ) like the Dassault Rafale or 5th generation stealth fighters like the Lockheed Martin F-35 Joint Strike Fighter? Have you wondered how the various air forces would train their pilots to fly these machines which typically cost more than a hundred million dollars each? The answer lies in a sub-class of aircraft known as the advanced jet trainer ( AJT ) and the lead-in to fighter trainer ( LIFT ). They generate far less public interest and attention than latest combat fighters but are instrumental in grooming the next generation warfighter. 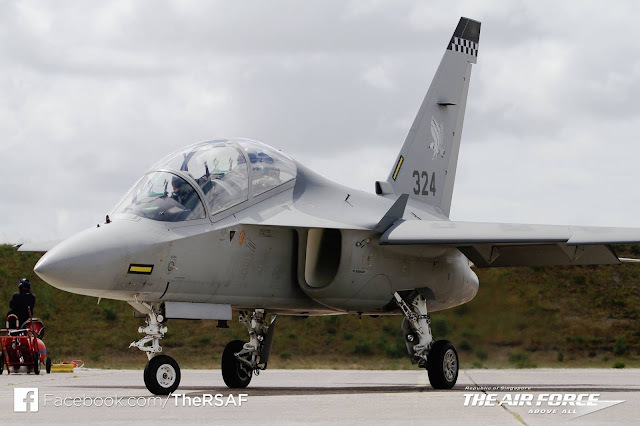 Today, we focus on the Alenia Aermacchi M-346 Advanced and Lead-In to Fighter Trainer, a.k.a. the Master. 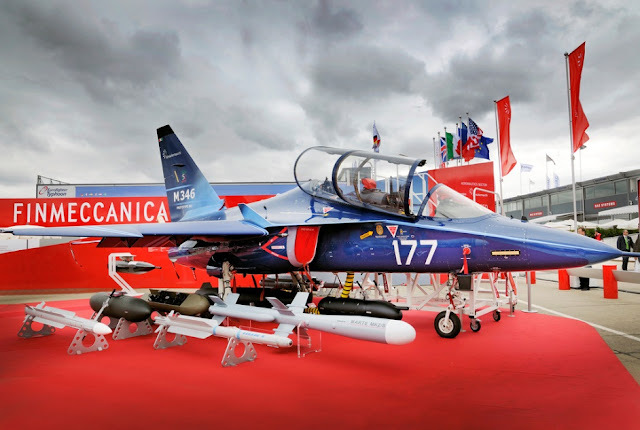 Alenia Aermacchi is an Italian aeronautical company whose core business is in the design and production of military trainer aircrafts. Its previous product line up includes the MB-326 basic jet trainer and the MB-339 advanced jet trainer, both of which were well regarded by their operators and had help train generations of fighter pilots. 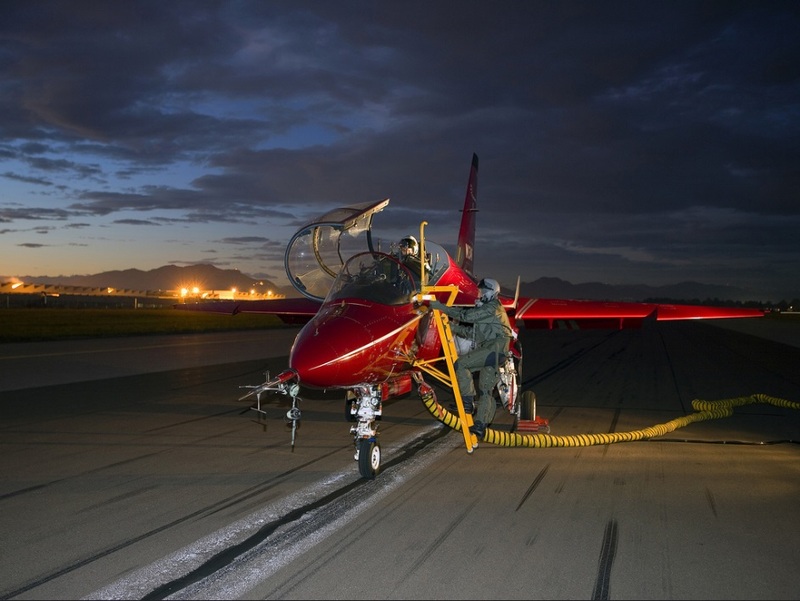 The company's latest portfolio consists of the SF-260 turboprop primary trainer, the M-345 HET high efficiency basic jet trainer and the M-346 AJT/LIFT. Apart from trainers, other products from the company includes the C-27J Spartan, the AMX fighter ( with Embraer ), the Eurofighter Typhoon ( with Airbus and BAE ), the Panavia Tornado ( with EADS and BAE ), the F-35 ( with Lockheed Martin ), the Sukhoi Superjet 100 ( with Sukhoi ) and the ATR-42 and ATR-72 ( with Airbus ). 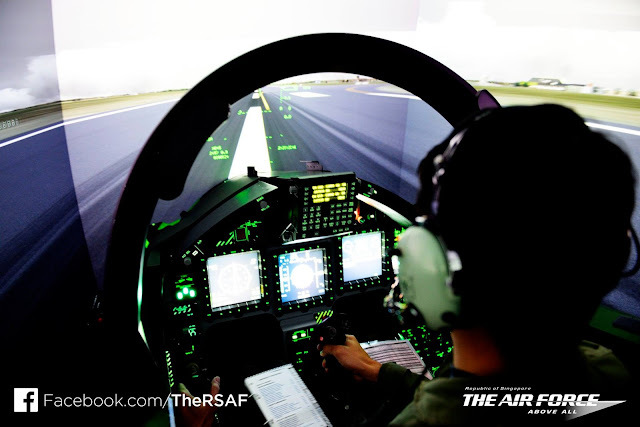 A trainer is a class of aircraft designed specifically to facilitate flight training of pilots. They are usually two-seat aircraft with either tandem or side-by-side sitting configuration and may have additional safety features not normally found in operational aircrafts like tandem flight controls. They frequently have excellent handling qualities and forgiving flight characteristics, thus allowing the trainee pilot to advance his or her skills in piloting, navigation and air combat safely and under the close supervision of the instructor. Military flight training is expensive and demanding and is usually conducted in progressive phases to weed out unsuitable candidates. Obviously, different types of trainer aircrafts would be required for each stage. The initial phase of the flight training where the candidate learns his first flying skills would typically be conducted with a light aircraft similar to civilian trainers like the ubiquitous, piston-engine powered Cessna 172. At the end of this stage, the trainees would be assessed as to where their attributes generally lie, fast-jets, multi-engine or rotary-wing. 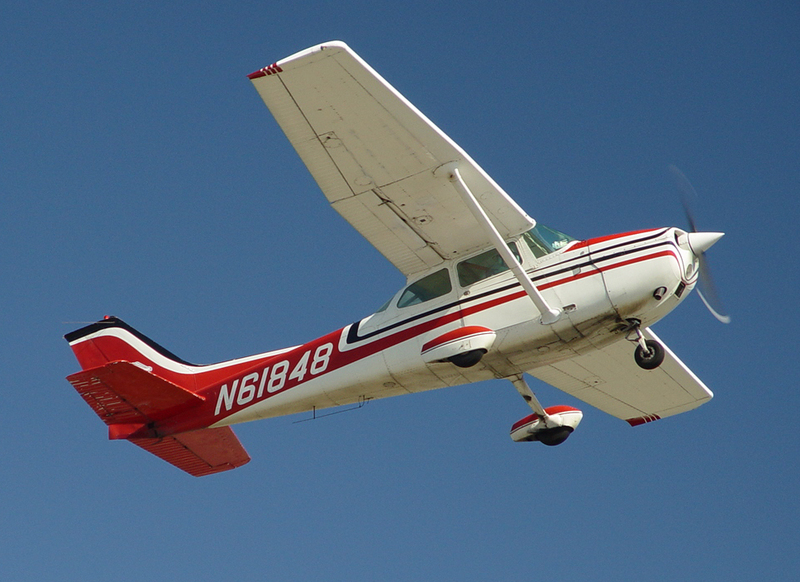 The Cessna 172M. Source Wikipeadia. The next phase is commonly known as Basic Flight Training and usually involves the use of turboprop basic or primary trainers which are obviously significantly faster and more powerful than the entry level trainers of the previous stage. Some modern turboprop basic trainers like the Pilatus PC-21 can even mimic the flight characteristics of jet trainers. Candidates eligible for fast-jets continue their training in the next phase with advanced jet trainers. 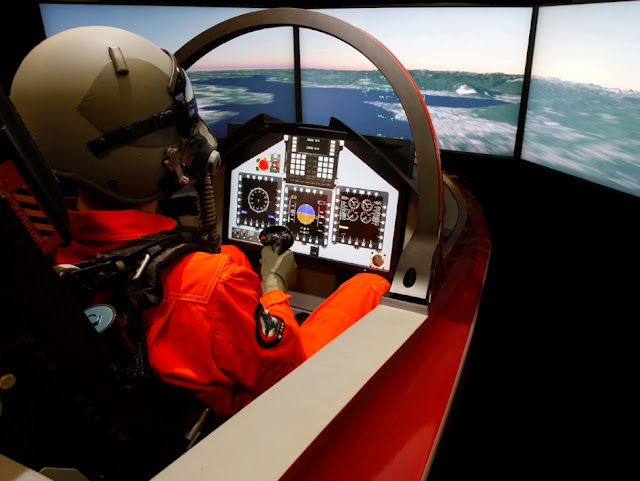 Advanced flight training for fast-jet hopefuls will now require an advanced jet trainer typically capable of high sub-sonic speeds and high energy maneuvers ( high sustained g ) complete with systems that can simulate modern sensor suites and weapon systems. While many AJTs lack radar systems, they may feature programmable multifunction displays that with inputs from data links and GPS systems can create in real time a virtual radar display. Many AJTs can also double as light attack aircraft or counter insurgency aircraft with little or no modification required. 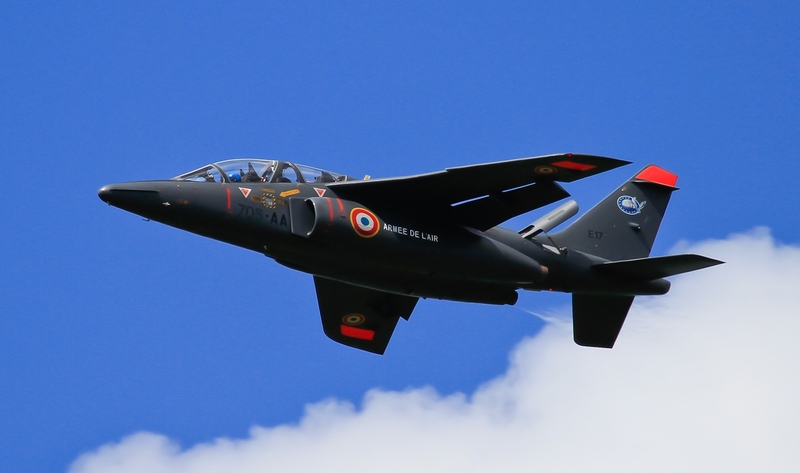 The Dassault / Dornier Alpha Jet light attack jet and advanced trainer is a good representation of this class. 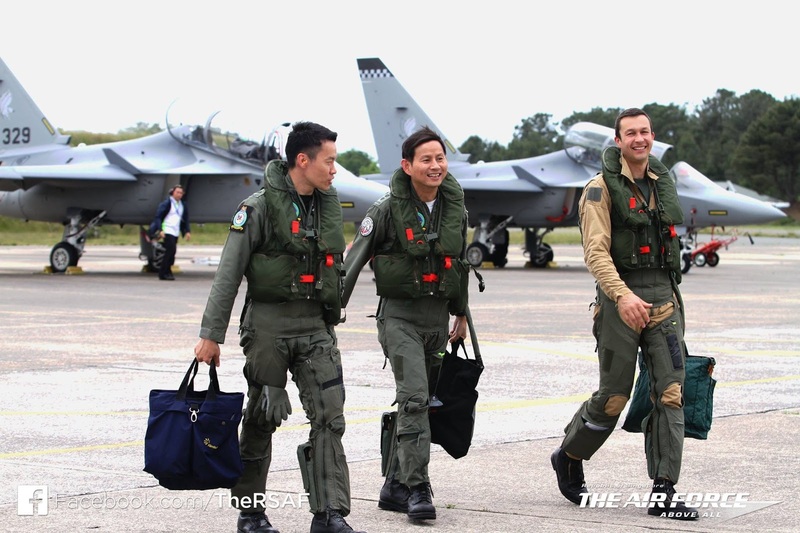 The next training phase of a prospective fast-jet jockey is the Lead-In to Fighter Training. As the name implies, this is the last stage before actual deployment into combat fighters. 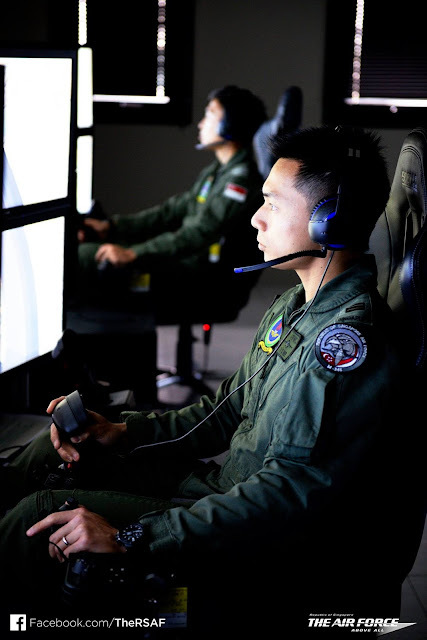 It aims to train the pilot efficiently for all sorts of combat scenarios at a lower cost compared to direct advancement to operational conversion in a combat unit. The Lead-In Fighter Trainer is usually an advanced jet trainer with avionics that can functionally emulate combat systems found in operational fighters. Its onboard processors may be linked with ground based training systems to simulate tactical threats and self-protection functions. 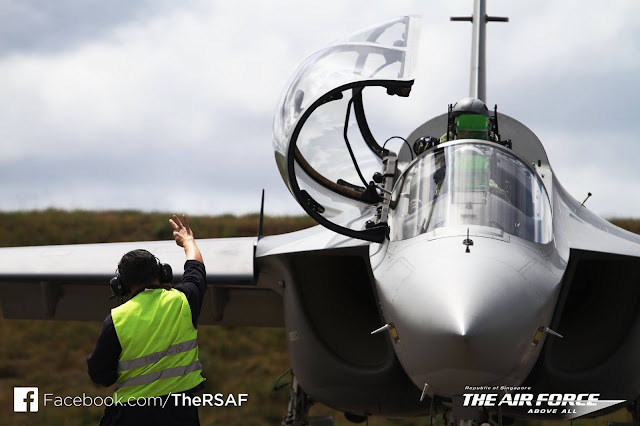 The M-346, one of the most sophisticated LIFT for the training of pilots for 4++ and 5th generation fighters even have design features like Hands On Throttle-And-Stick ( HOTAS ) and are Helmet Mounted Display ( HMD ) compatible. The final stage of flight training is operational conversion and is obviously aircraft specific. The rookie pilot usually trains in a two-seat version of the aircraft type that he is destined to fly with. 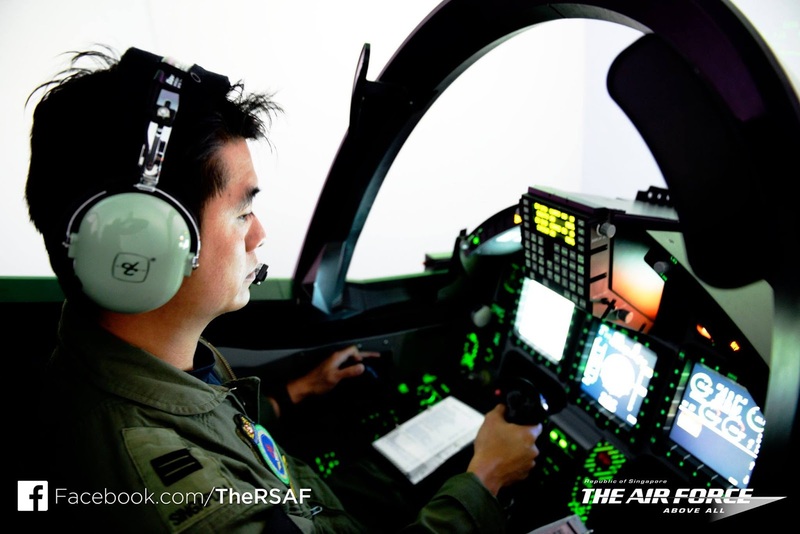 Operational conversion teach the pilots how to fly a particular aircraft and the best tactics to fully exploit the performance and capabilities of that aircraft. Most trainer aircrafts used for operational conversion are fully combat capable with only a slight reduction in performance compared with their single-seat peers. 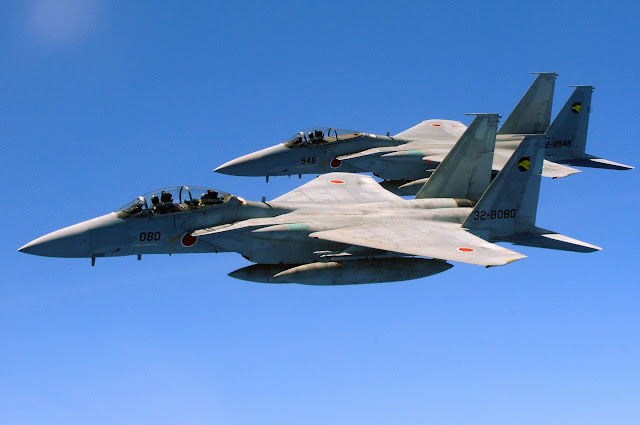 The F-15D for example, is the two-seat training version of the single-seat F-15C air-superiority fighter. Note : The F-22A and the F-35 of all variants are unique in that unlike all the previous generations of US fighter aircrafts, they do not have any two-seat trainer versions. Advancement in simulator technology was deemed sufficient to negate such a requirement. That only made the lead-in to fighter training even more important. 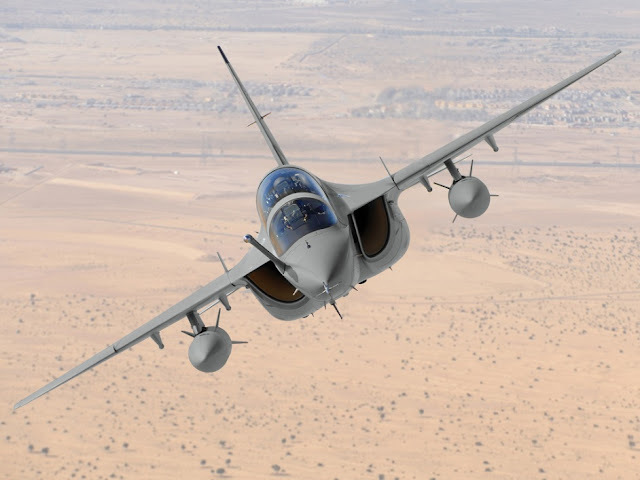 The M-346 is a tandem seat, sub-sonic, dual-engine military jet trainer designed for advance jet training and lead-in to fighter training for the latest 4++ generation and 5th generation fighters like the Eurofighter Typhoon and the F-35 Lightning II Joint Strike Fighter. 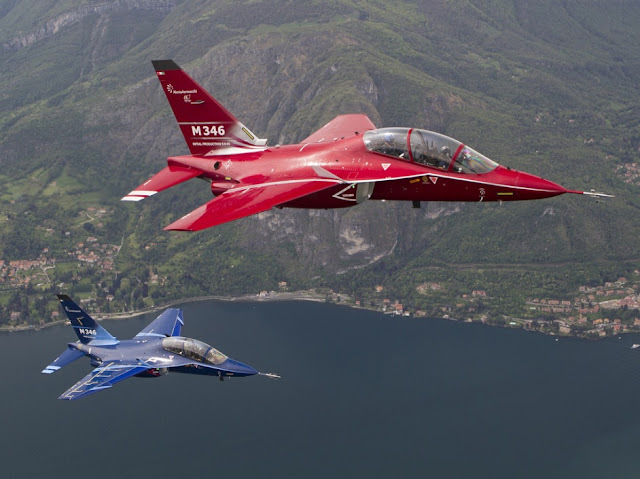 Finmeccanica, the parent company of Alenia Aermacchi, describes the M-346 as " the most advanced trainer aircraft on the market today and the only one specifically designed to prepare pilots for high performance new generation aircraft " and they might just be right! Below are some of the notable features of the M-346. 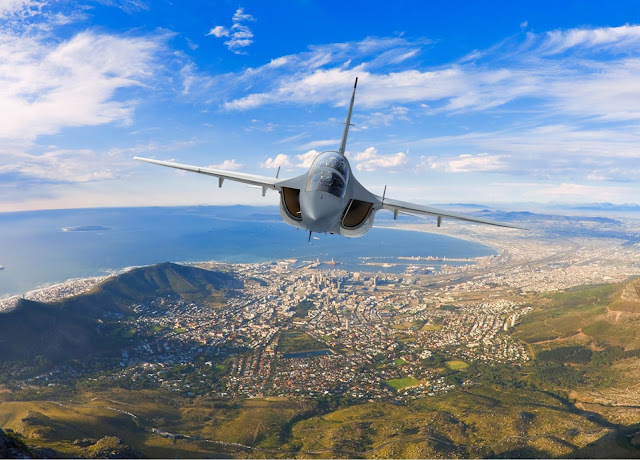 The aircraft was designed with the concepts of " design-to-cost " and " design-to-maintain " right from the beginning, thereby reducing acquisition costs and operational costs. 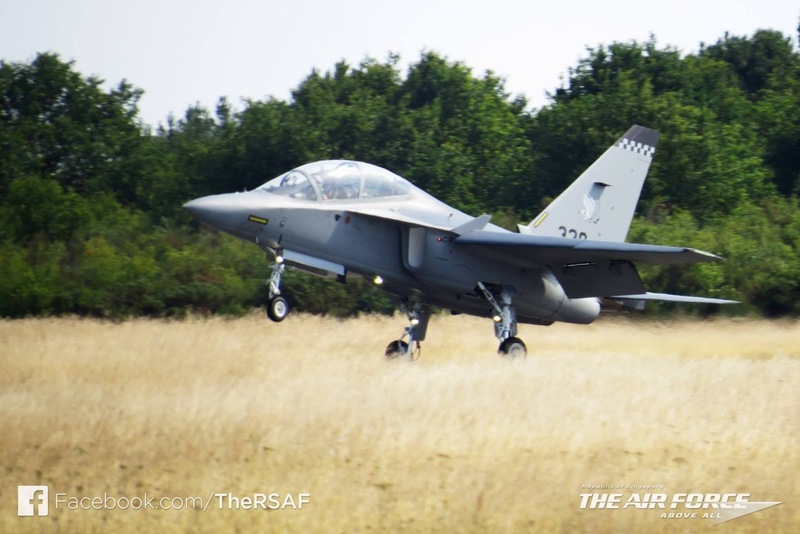 The M-346 has an operational cost which is alleged to be just a tenth of the Eurofighter which Jane's estimated to be about US$18000 per flight hour. For comparison, flying a block 40/50 F-16 would cost about $7000 per hour. The M-346 has a full authority, quadruplex digital fly-by-wire flight control system which together with an optimized aerodynamic design enables full maneuverability and controllability at very high angle of attack ( typically greater than 35 degrees ). 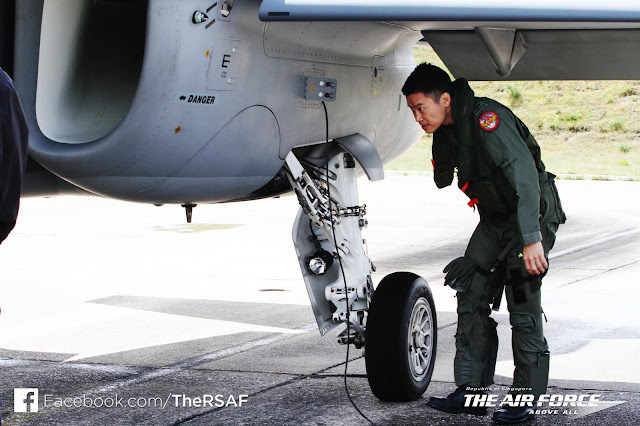 The angle of attack and g-force limitations of the aircraft are even adjustable to suit the training syllabus. 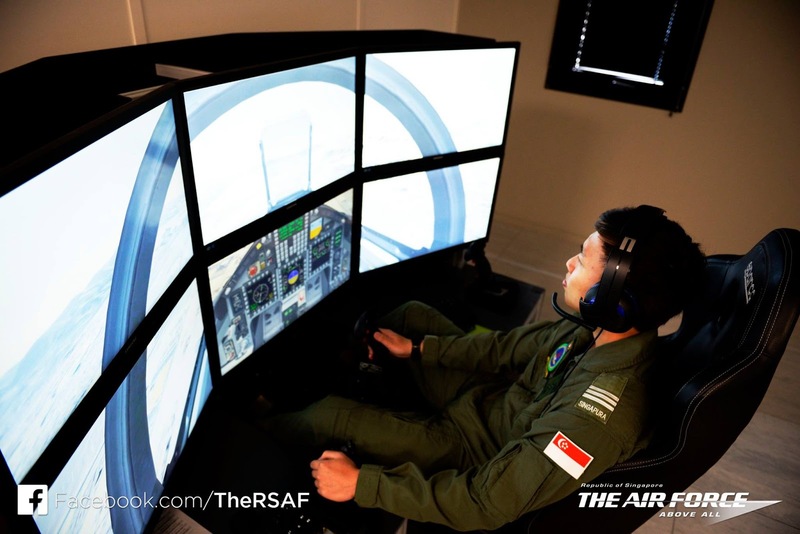 It has a digitalized glass cockpit designed with the HOTAS philosophy and features 3 colour multifunction displays, Head-Up Display and is compatible with night vision goggles and optional helmet mounted display. The M-346 has a pilot activated recovery system installed. When triggered, it performs automatic recovery by restoring the aircraft back to a steady and level flight path. Powered by a pair of Honeywell F124-GA-200 low bypass turbofans, it is capable of transonic flights without the use of afterburners. Its has a vast flight envelope and together with a high thrust to weight ratio and high maneuverability enables the M-346 to offer flight handling similar to those of next generation multi-role combat aircraft. 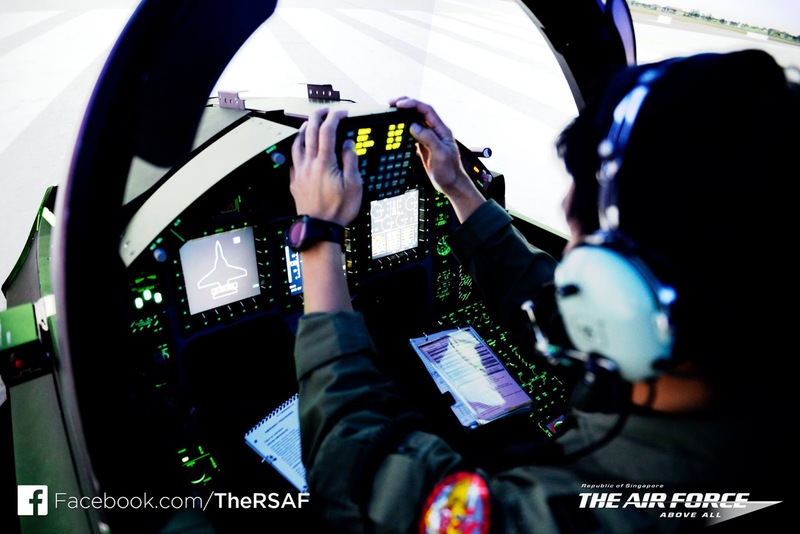 It maximizes training effectiveness and reduces the need to fly sorties on the much more expensive two-seat versions of the frontline combat aircraft, effectively prolonging their operational lifespan. 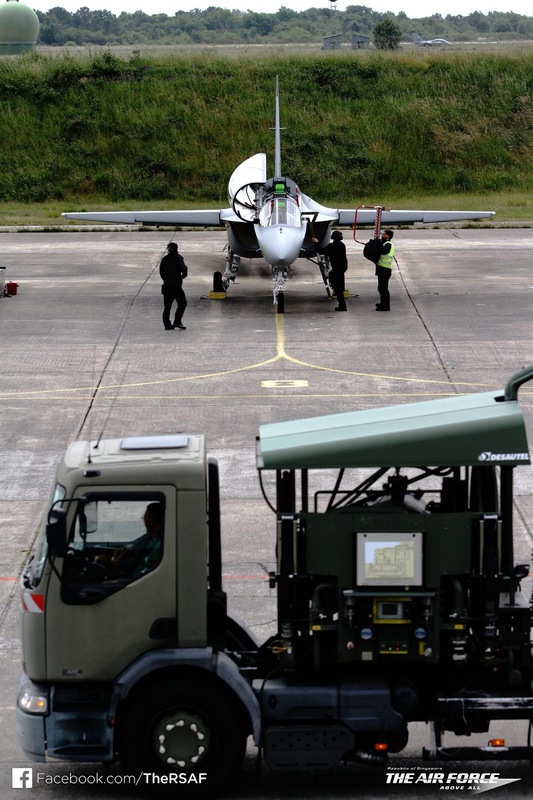 The onboard Embedded Tactical Training Simulation ( ETTS ) system allows the M-346 to emulate sensors, countermeasures and armaments. It can also interface with various munitions and equipment that are actually carried by the aircraft. The ETTS can act in a standalone mode where training data is preloaded pre-flight or in a network mode where data from a ground monitoring station is received and acted upon in real time via datalinks. 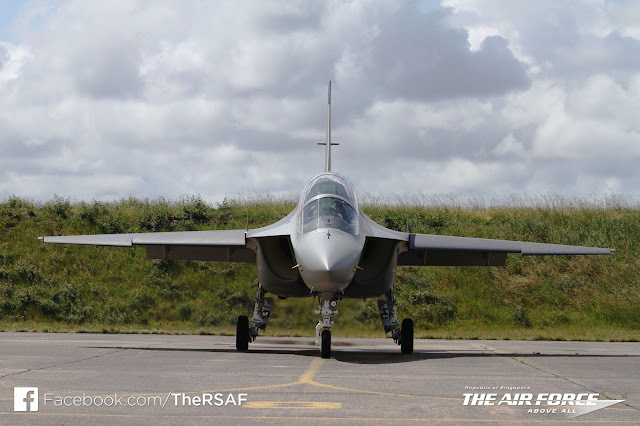 The M-346 has 9 hardpoints comprising of 2 wingtip, 6 under-wing and 1 under-fuselage pylons for carrying up to 3000kg of external loads. These may include short range air-to-air missiles like the IRIS-T or Sidewinder, Mk82/83/84 unguided bombs, precision guided munitions like GBU12 and GBU-16, AGM-65 air-to-surface missiles, anti-ship missiles, Brimstone anti-armour missiles, Durandal anti-runway dispensers, rocket pods like LAU-32 and up to 3 drop tanks on the centerline and innermost wing pylons. 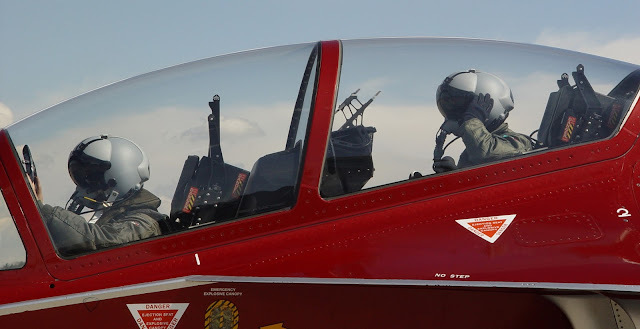 The integration of a helmet mounted display system, vocal control inputs and a removable in-flight refueling probe ensures that the M-346 can carry out a complete tactical training syllabus. Optional electronic warfare systems, self-protection systems like radar warning receivers and flare and chaff dispensers, tactical data link systems, a multimode fire control radar, radar signature reduction kits and a slew of external pods including targeting pods and gun pods enables the M-346 to be deployed in real combat operations, should the need ever arise, with excellent levels of effectiveness and good chances of survival. 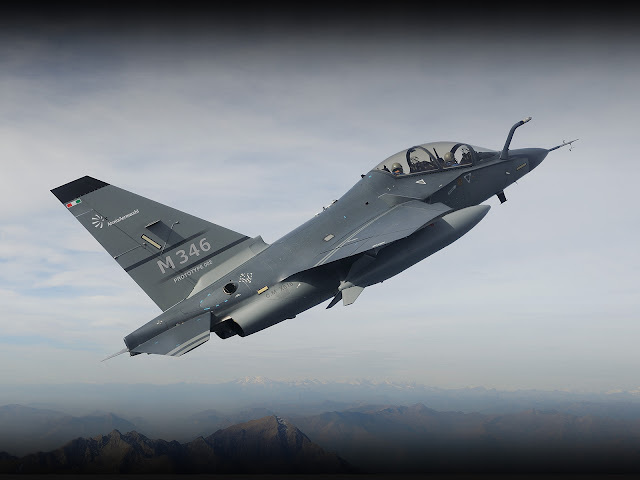 The M-346 can be part of a bigger package offered by Alenia Aermacchi - the Integrated Training System ( ITS ) which includes a complete Ground Based Training System (GBTS), comprising academics, simulators, mission support system and computer-based training management system. The ITS has already been adopted by the Italian Air Force, M-346's launch customer. a replica of the real front cockpit, mounted on a fixed base. Finmeccanica SpA. Yakovlev YAK-130 : The Evil Twin? You would have been forgiven if you thought you saw double. From the two images above, red stars aside, only the expert could tell the difference between the YAK-130 and the M-346. Yes, the M-346 has an evil twin and that's because their have a common origin. For this, we have to return to the early post-Cold War years of the 90s, where Russia had identified the need to replace its fleet of legacy Aero Vodochody L-29 and L-39 jet trainers. At that time, five aero-design bureaus submitted proposals, but by 1991, after whittling down, the two competing finalists were the Mikoyan MiG-AT and the Yakovlev YAK-UTS. During those halcyon times, everybody was keen to reap the dividents of the peace. Perhaps taking advantage of the new found openness of Russia and the former Soviet republics, a string of joint projects between the East and West were initiated , one of which was the cooperation agreement Aermacchi signed with Yakovlev in 1992 to provide financial and technical support for the YAK-UTS prospective trainer project. By then, the aircraft was marketed as the YAK/AEM-130. By Sep 1993, the design of the YAK/AEM-130 was completed. First flight took place in April 1996. However, from 1998 onwards, the project took a turn for the worse and was increasingly becoming an Italian led effort after the Russians failed to provide adequate funding on their part. In mid-2000, the partnership between Aermacchi and Yakovlev was dissolved due to their differences in priorities and the lack of funding from Russia. It was agreed that each firm would continue to develop the aircraft independently and Aermacchi would be able to sell the M-346 to NATO countries while Russia would be able market the YAK-130 to the ex-Soviet republics, India and Algeria. Yakovlev were to receive US$77million from Aermacchi for the technical documents of the aircraft. The YAK-130 was eventually selected by the Russians as their next generation trainer in 2002, emerging victorious over the MiG-AT, mainly because it is dual role capable as both an advance trainer and a light combat aircraft. It has 9 weapons hardpoints and can carry 3000kg of external loads, exactly the same as the M-346. What's different is that this badass evil twin is designed to operate from unprepared airfields as well, and even has engine in-take blanking doors that can prevent foreign object damage. And while that has got not much to do with its effectiveness as a trainer, this enhanced capability matters greatly in combat efficiency. 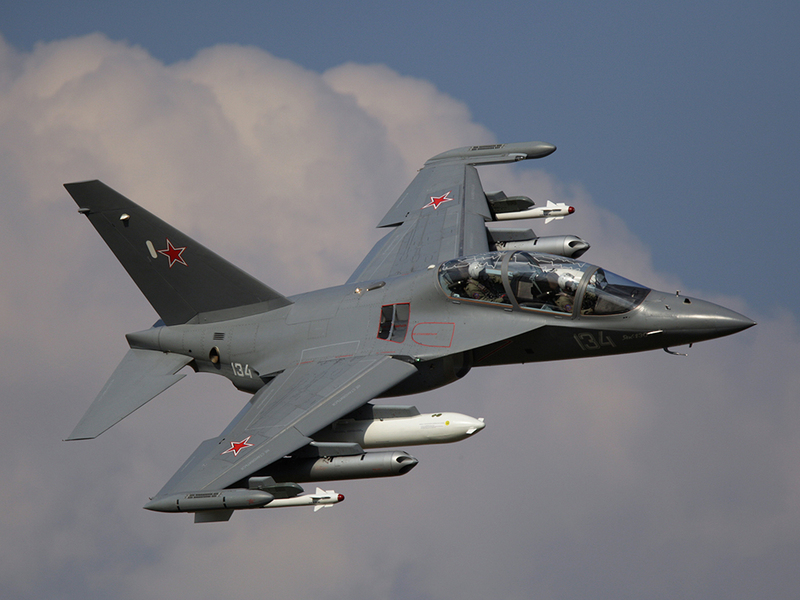 The YAK-130 with an assortment of pods, air-to-air and air-to-ground munitions. 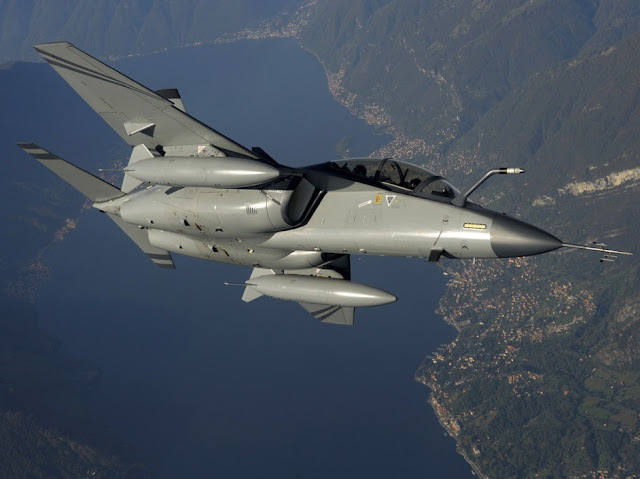 The initial order of 15 M-346 aircrafts came from the Aeronautica Militare ( Italian Air Force ) in 2009. They are officially given the designation T-346A by the Italian Air Force which received its first aircraft in Nov 2011. They are operated by the 212th Squadron based at Lecca-Galatina Airbase in southern Italy. IHS Jane's Defense Weekly ( 30th Mar 2016 vol 53 issue 13 ) reported that Italy had now increased its total order for the T-346A to 18. The Italians had already launched their Phase 4 LIFT programme on the T-346A since Sep 2015. For now, trainees would ultimately operationally convert to one of Italy's 3 current fighter types, the Eurofighter, the AMX or the Tornado. In the near future, the pilots will also be groomed for operational conversion to the F-35. Italy, a Tier II partner in the Joint Strike Fighter programme, has a projected requirement for a total of 90 F-35 comprising 60 conventional F-35A for the air force and 30 short take-off and vertical landing F-35B for the navy. The first export customer was the Republic of Singapore Air Force ( RSAF ) which placed an order for 12 M-346 in Sep 2010 to replace its ageing A-4SU Super Skyhawk trainers. 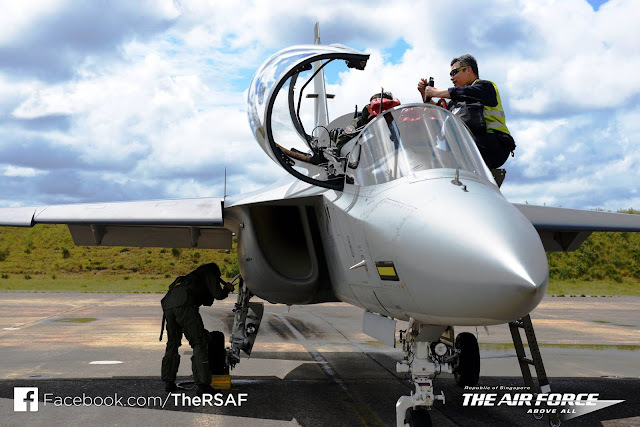 The first M-346 for the RSAF was rolled out in July 2012 and delivered later that year. Since then, all 12 aircrafts had been delivered and they had been inaugurated into the RSAF's 150 Squadron based in Cazaux, France. 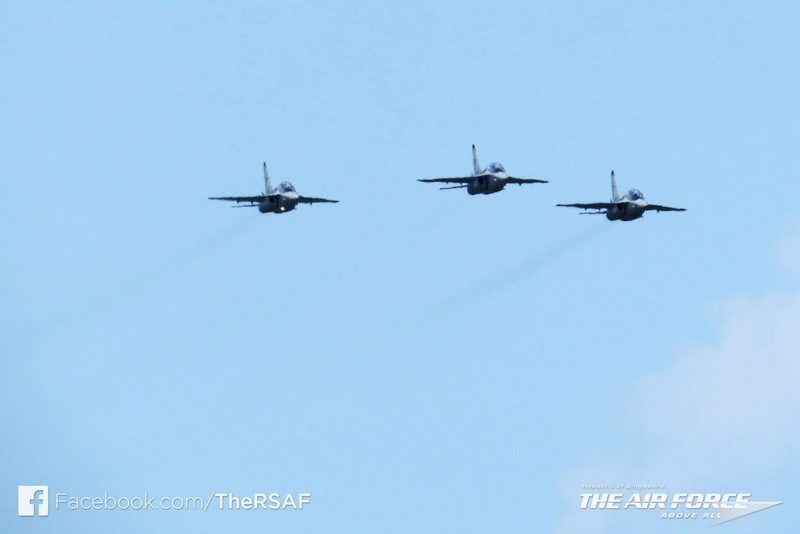 The RSAF operates a mix of 32 F-15SG and 62 F-16C/D/D+ as well as some upgraded F-5S/T fighters. 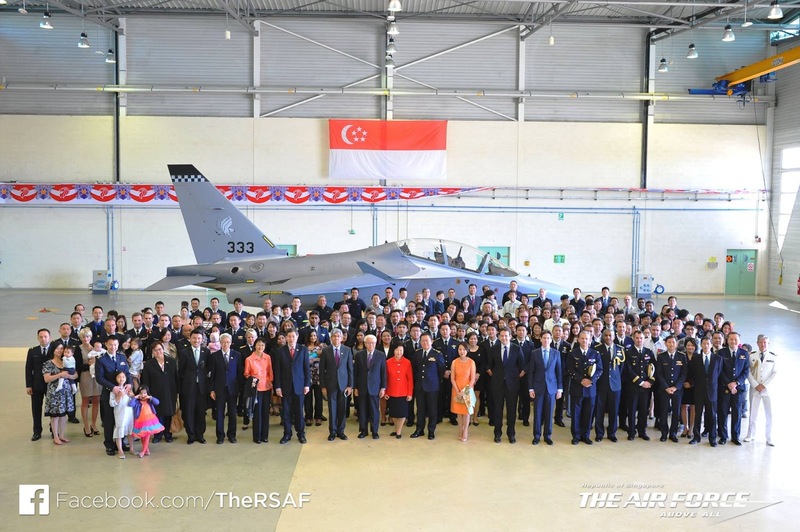 Although Singapore is a Security Coorpeation Participant of the JSF programme since 2004, no decision as yet been made to acquire the F-35. In July 2012, the Israeli Air Force ( IAF ) placed an order for 30 M-346 to replace its fleet of A-4N/H Skyhawk trainers. 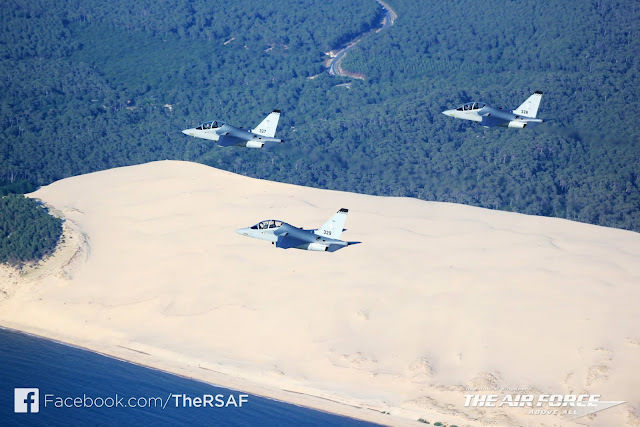 The first 2 M-346 for the IAF was delivered in July 2014 and all would be delivered by end 2016. The Israelis named their M-346 " Lavi " which means lion cub in Hebrew. This could prove confusing for the uninitiated as there was a failed 4+ generation fighter project by the Israel Aircraft Industries in the eighties which is also known as the IAI Lavi. The Israelis are also in the JSF programme as a Security Cooperation Participant and have a firm commitment for 100 F-35I "Adir", the first of which was delivered in Jan 2016. 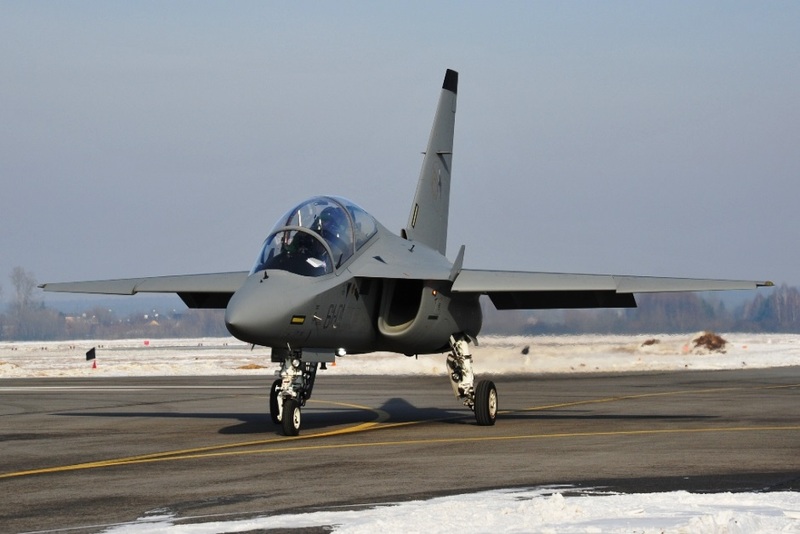 In Feb 2014, the Polish Air Force placed an order for 8 M-346 to replace its 37 or so ancient PZL TS-11 jet trainers. The first 2 aircrafts would be delivered in Nov 2016. The Poles fly the F-16C/D and the MiG-29A. They are fortunately or unfortunately not in a position to contemplate any F-35 acquisition at the moment. 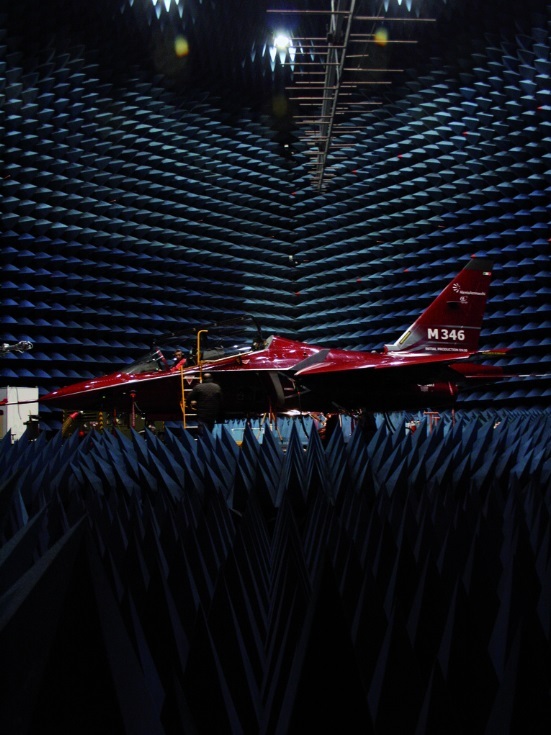 Update 8th Aug 2016 : In what would seem to be the biggest M-346 deal so far, Taiwan's state-owned Aerospace Industrial Development Corporation ( AIDC ) has just signed a memorandum of understanding with Leonardo, Finmeccanica's new name adopted since 28th Apr 2016 ( after this article was written ), to supply 66 M-346 advance trainers to the Republic of China Air Force ( ROCAF aka Taiwan Air Force ) to replace its ageing indigenous AT-3 trainers and probably the F-5s as well. 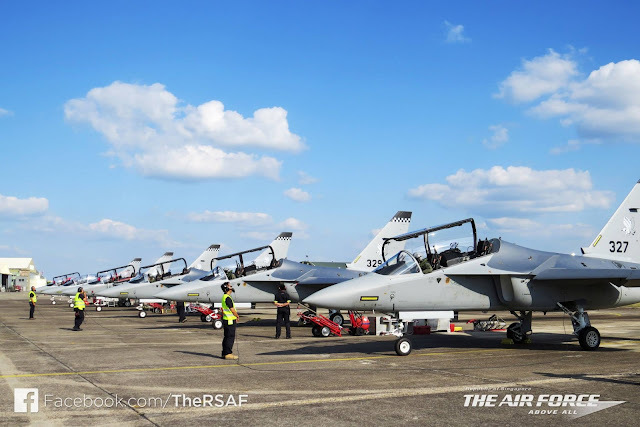 The first 4 to 6 aircrafts will be constructed in Italy while the rest will be assembled in Taiwan, with 50% of the components imported from Italy. Technology transfer will be on the cards. The advantage that the M-346 has in Taiwan? 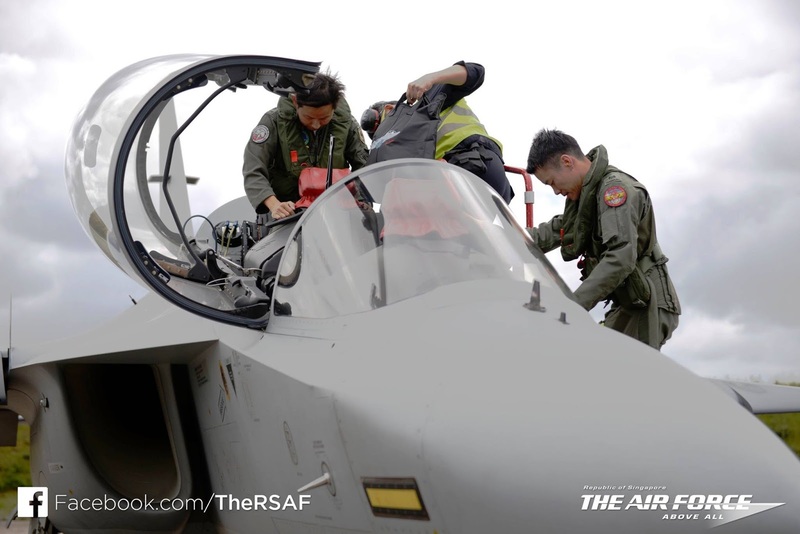 Its Honeywell/ITEC F124 engines is in fact the non-afterburning version of the F125 that powers Taiwan's Indigenous Defense Fighter, the AIDC F-CK-1 Ching-Kuo. That makes its maintenance in Taiwan potentially a lot easier. You can read about the deal in old script Chinese here. A significant victory for Leonardo. Now, if only the USAF could also be snared as easily. 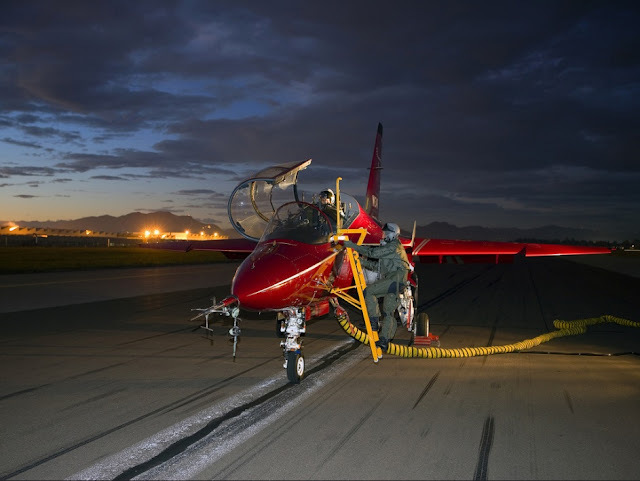 The T-X Program is the US Air Force's ( USAF ) next generation jet trainer propramme to replace the Northrop T-38 Talon jet trainer which has been in service for more than 50 years. 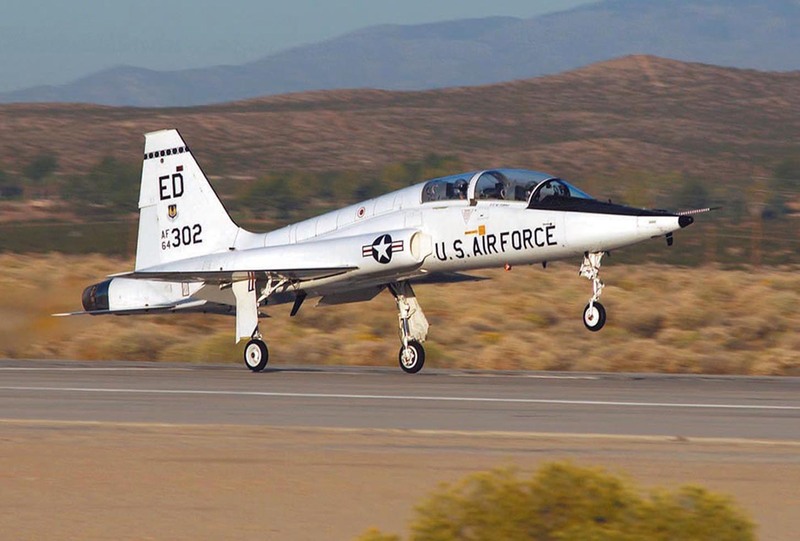 The T-38 is notable for being the world's first supersonic jet trainer and shares a common origin with the F-5A Freedom Fighter. 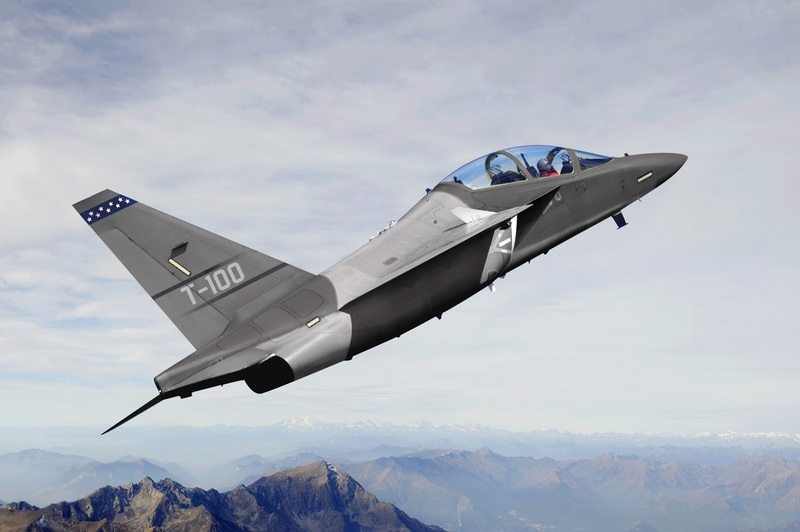 Potential bidders include Lockheed Martin and KAI with their T-50A Golden Eagle offering, Northrop Grumman with BAE, L3 and Rolls Royce with an improved version of the successful Hawk T2/128, and Alenia Aermacchi partnering Raytheon with the M-346 which is re-designated the T-100 for the T-X Program. There would be an initial requirement for 350 aircrafts with a possibility of the eventual total acquisition exceeding 1000 aircrafts. 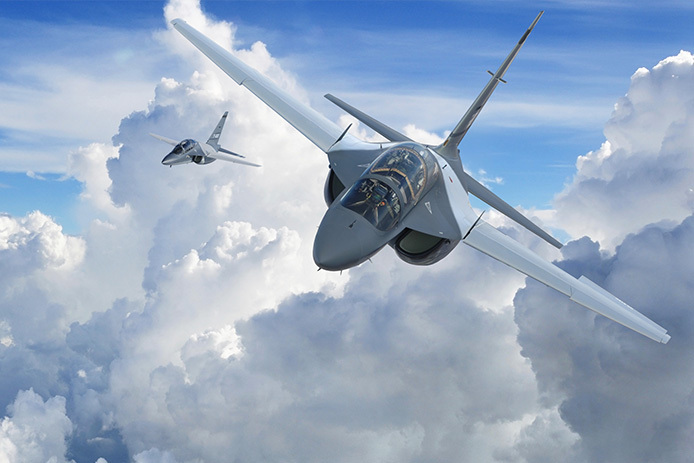 This is one competition which Alenia Aermacchi cannot afford to lose as the USAF is possibly the biggest buyer in the Free World for any military aircraft and such opportunities only present themselves once in more than half a century! Last year, Alenia Aermacchi's hope for success in the T-X Program was casted in doubt after the abrupt withdrawal of their initial US partner General Dynamics C4 Systems and new amendments in the RFI for the prospective trainer aircraft to be able to maintain a sustained load factor of at least 6.5g for a minimum of 140 continuous degrees during a 180 degree turning maneuver. Fortunately, Raytheon stepped in to take over as Alenia's American partner and prime contractor and the sustained g issue was overcome with software tweaks. The T-X Program would likely be initiated in FY2017 with a planned IOC of the selected aircraft in 2024. A T-100 wallpaper image by Raytheon. Should the T-100 be selected as the T-38 replacement, it would be used to train USAF pilots for eventual deployment in the F-16, F-15, F-22 and F-35 fighters. It could also potentially be the closest thing to actually flying a Russian aircraft for these American pilots, as the T-100 / M-346 basically share the same origins with the YAK-130. It could also mean that for the first time ever, both Russia and America could be training their elite pilots for their most advanced 4++ and 5th generation fighters like the PAK-FA and the F-22 using essentially the same aircraft, not unlike some kind of evolutionary convergence that we so frequently observe occurring in nature. 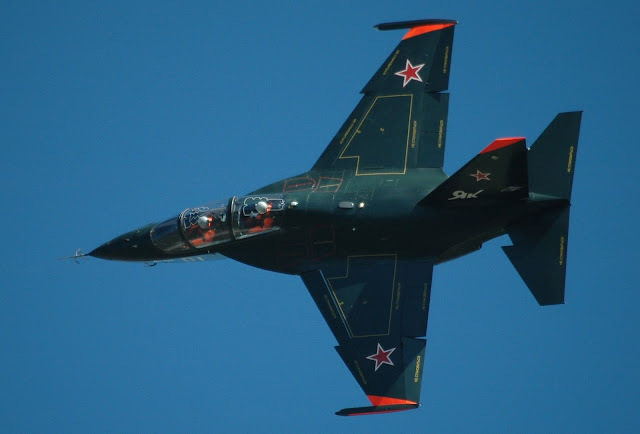 Although the M-346 was not originally designed to have a dual role as a trainer and a light combat aircraft like its evil twin the YAK-130, it can easily be reconfigured to assume operational functions which can include air-to-air missions, anti-shipping and ground interdiction roles. In fact, the M-346 LCA ( Light Combat Aircraft ) option which can reportedly fire Brimstone missiles had been offered to Poland to replace its ageing Su-22 bomber. The M-346 retains a high thrust to weight ratio even under a full combat load of 3000kg. 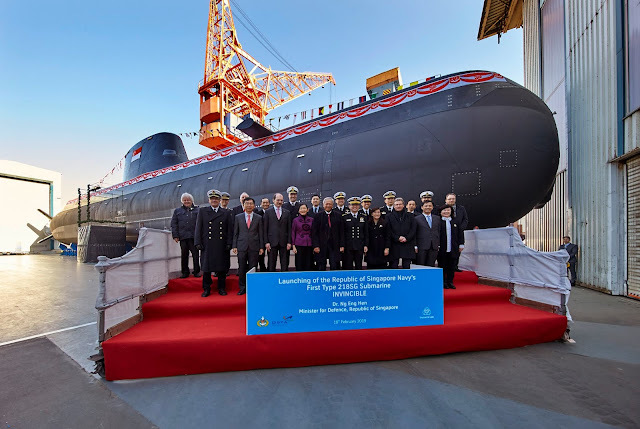 It has an impressive persistence due to its large internal fuel capacity and the ability to carry up to three 630 liter external tanks and capability of aerial refueling. It is compatible with an assortment of air-to-air and air-to-surface ordnance mounted on nine external hard points and has high maneuverability even with an engine crippled. All these characteristics make the M-346 an excellent back-up fighter especially in the " Homeland Defense " role. 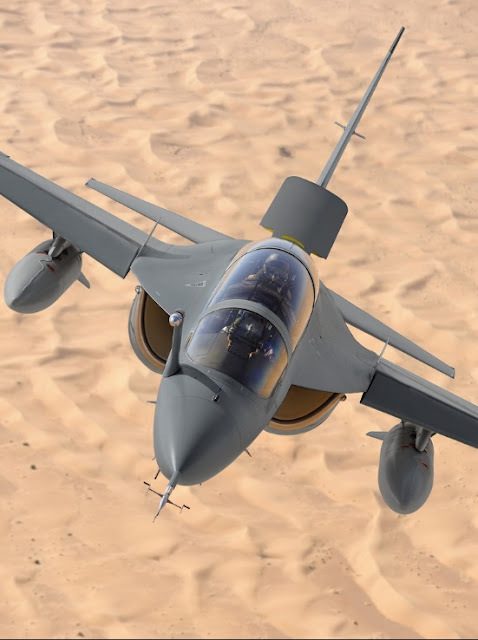 The M-346 LCA could be an attractive option for less affluent nations looking for a quality trainer with secondary combat capabilities at a reasonable price. 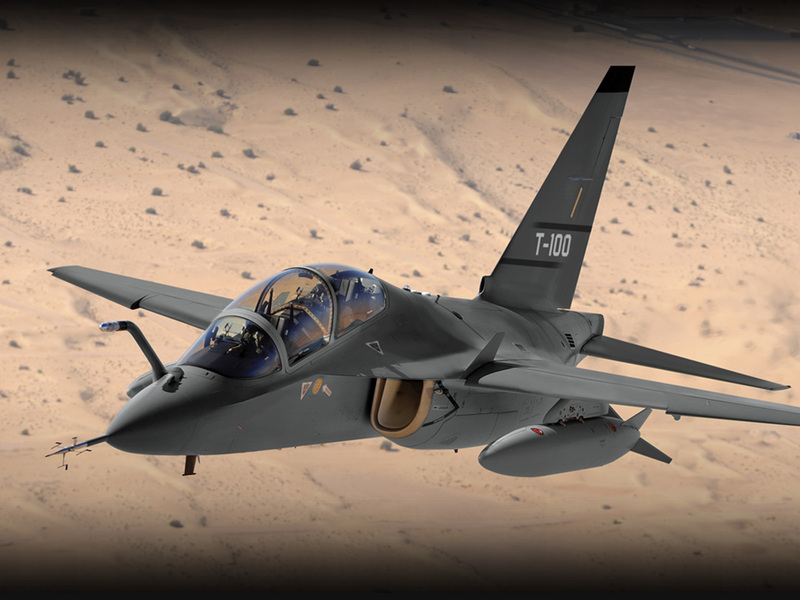 A navalised M-346 might be necessary especially if Alenia Aermacchi wins the T-X bid. 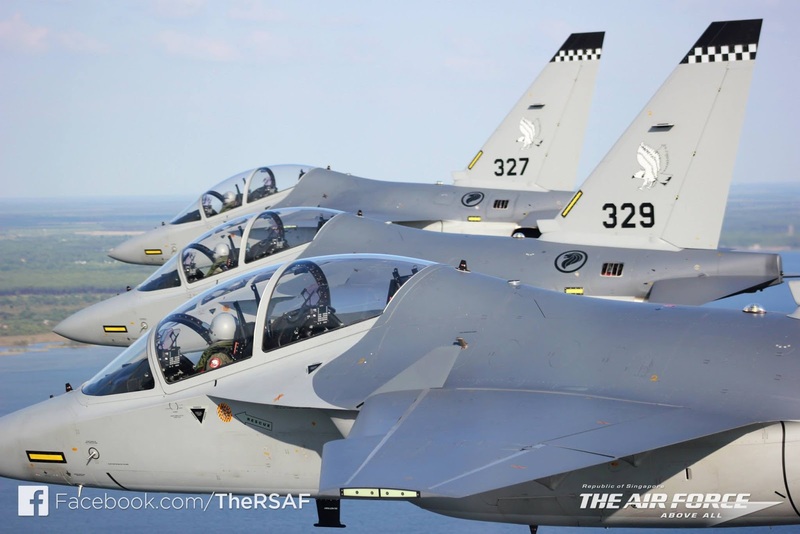 Don't forget that the US Navy would also be flying the F-35 in its carrier based configuration, the F-35C, and these naval aviators would no doubt also require a lead-in fighter trainer to prepare themselves for operational conversion. The USN's current AJT is the Boeing T-45A Goshawk which has been in service for the past 25 years. They may have been adequate for preparing pilots for the Hornets and Super Hornets but would probably fall short when it comes to the JSF. The other potential client would be the French Navy who operates the Rafale M from their aircraft carrier the Charles de Gaulle. So a marinised version with a tail hook capable of catapult take-off with arrestor landings might be a future possibility. 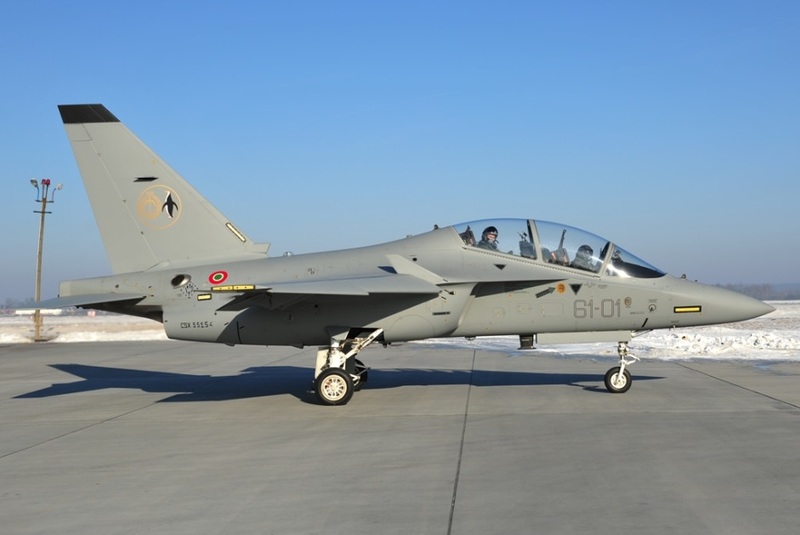 Since Feb 2016, Alenia Aermacchi has been promoting the M-346 in two new roles, as a companion trainer and in dissimilar air combat training ( DACT ). 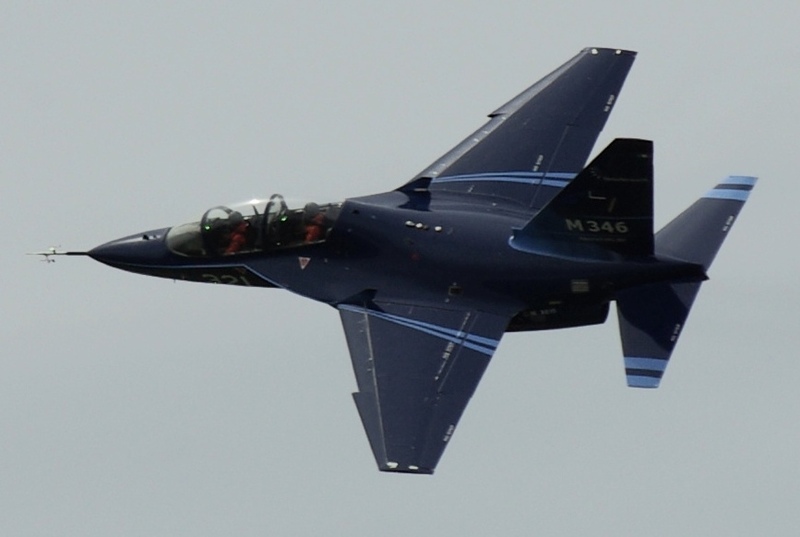 The M-346 is particularly suited to take on the role of an aggressor aircraft in DACT since the two important parameters of g force and angle of attack can be independently selected and adjusted in the flight control system enabling the M-346 to simulate the performance of various types of enemy aircrafts. Utilising the M-346 in the aggressor role can free up other high-end operation aircrafts otherwise dedicated for DACT, like those tiger-stripped F-16N ( now retired ) and F-16A at the Naval Strike and Air Warfare Center at NAS Fallon, Nevada. Not to mention that they are far more economical to fly compared to operational combat aircrafts. In addition, further savings could be expected with networking between the ground based training system and the aircrafts involved in DACT such that a 2 on 2 training scenario that traditionally involved 4 aircrafts can be achieved with just one M-346 aggressor. The other aggressor would be flown in the simulator at the ground based training centre and would show up in the helmet mounted sights of the DACT participants in the air. Virtual aggressor! 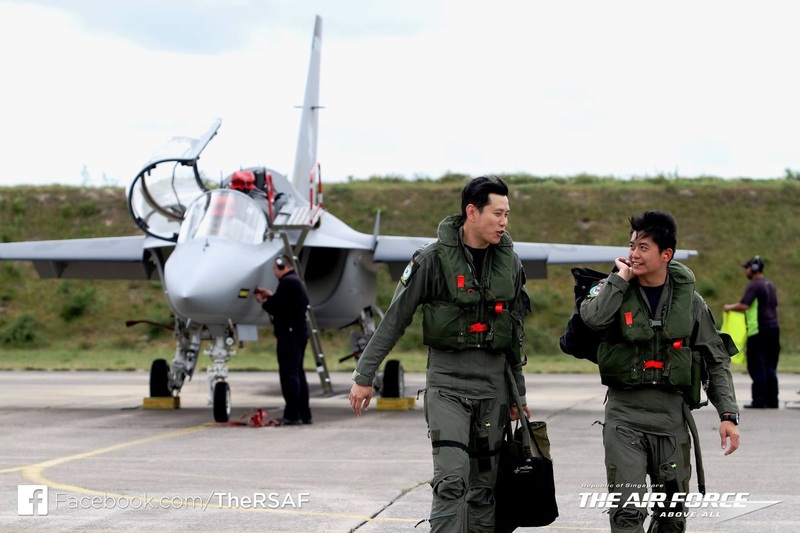 The concept of a companion trainer is to allow pilots to fly mixed hours on their operational aircraft type and the advanced trainer and yet still maintain their combat readiness. This arrangement is obviously much more economical and at the same time extends the operational lifespan of the frontline aircraft since it would be flown less frequently. The small number of F-22A Raptors of the USAF ( only 187 built ) that are always in high demand for deployment to hotspots around the globe would probably benefit most from the adoption of such companion trainers. dissimilar air combat training by its makers. 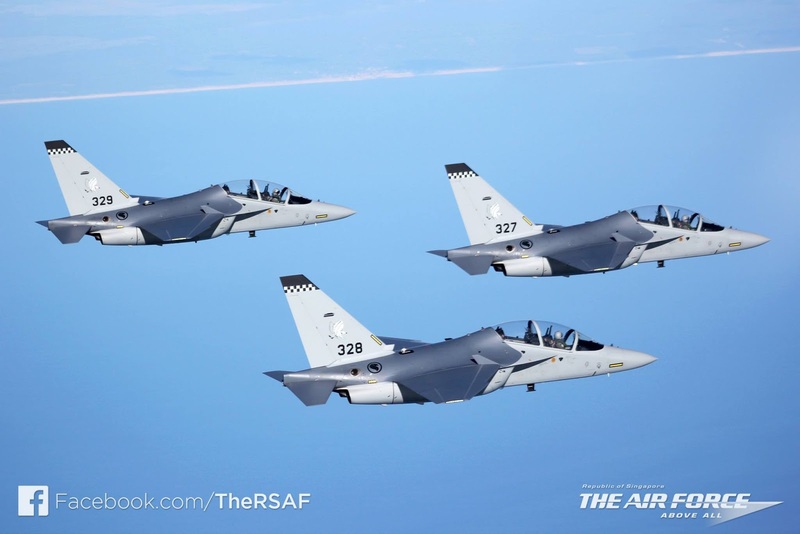 The fact that the M-346 was selected as an advance trainer / lead-in fighter trainer by both the RSAF and the IAF speaks volumes for the aircraft and its designers. 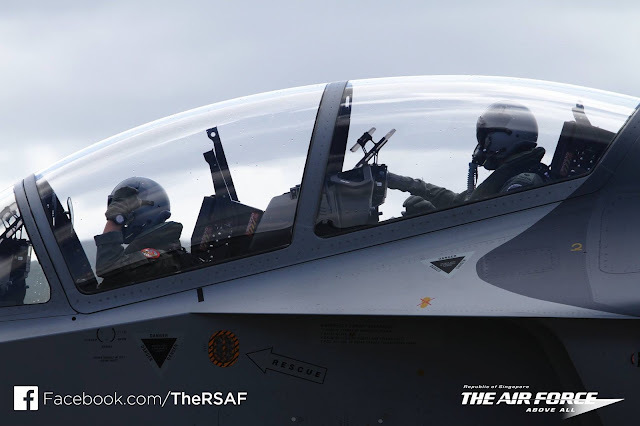 These two air forces are among the best in the world with very high standards and a high degree of professionalism. 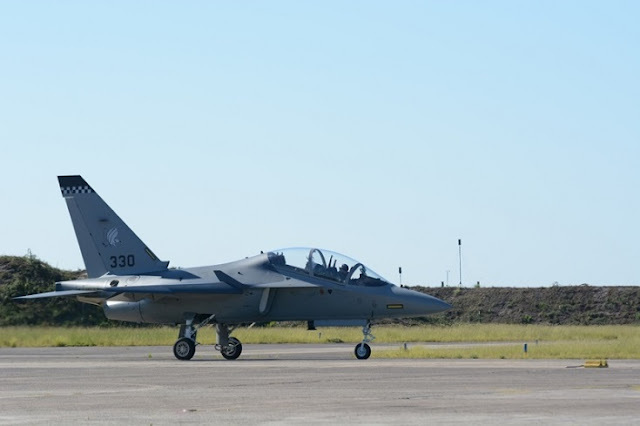 The M-346 would definitely be used for lead-in training for potential F-35 pilots in Israel and Italy as both have already received their first F-35I and F-35A respectively. It is probably only a matter of time before Singapore would finalise its decision to acquire the F-35 as well, and it all depends on what other regional air forces do, like Indonesia and China buying the Su-35 Super Flanker. 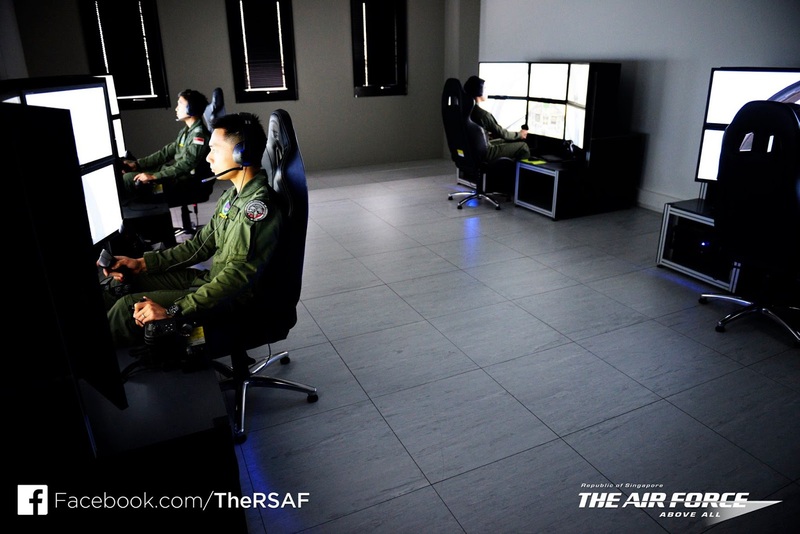 Know that if and when that day comes, the RSAF would already have in place all the necessary expertise and training infrastructure, on the ground as well as in the air, to prepare its pilots for F-35 operational conversion. Here's a visual tour of the RSAF's 150 Squadron with its fleet of 12 M-346, currently base in Cazaux, France. 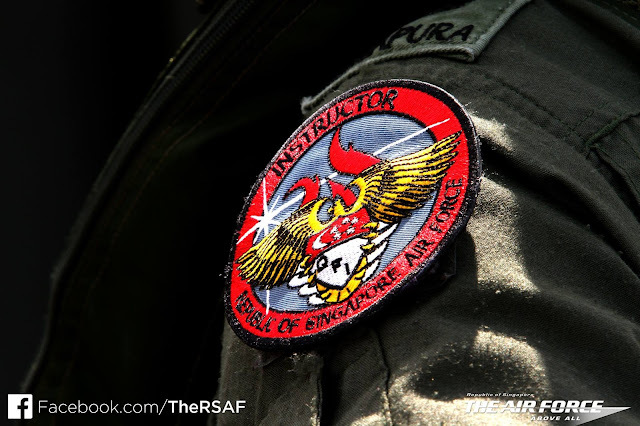 All images below sourced from the RSAF. 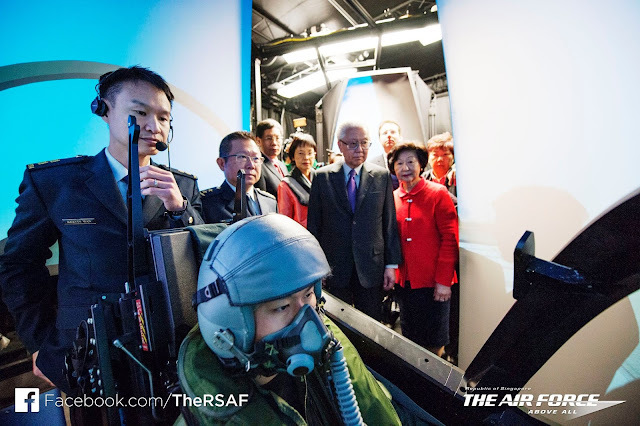 President and Mrs Tony Tan witnessing M-346 simulator training. Ground based training with similators. How many GTX Titan Z will that require?